So, down to business, I guess. Now I’m on a mission to get this under my belt. Grab your popcorn; are you sitting comfortably? Then I’ll begin. Alicia K of the truly inspirational blog, “Keys to the Kingdom,” kindly gave me the “Sisterhood of the world” award. Thank you so much, Alicia. I’m not sure what I’ve done to deserve such a lovely award, but I do so appreciate it. Trudi of “The Gingerbread Cafe,” “Campanulla Della Anna,” and Inge of “The Retiring Sort” blogs, have all given me “The Versatile Blogger Award,” for giving inspiration and ideas to them. Oh what bliss to receive an award which has no rules and no strings attached, simply because you love my blog. Thanks Roly; I love it. Now that ‘The Oscars’ are over, all that remains is for me to wish you all a splendid rest of the weekend. The new Daily Post challenge, “Fleeting moment,” is ideal for this photo which I got when we went walking along our promenade yesterday afternoon. The weather was so perfect again, and we walked quite a bit further than usual, right to the the start of the Lagoon Nature Reserve. Years ago, one could just carry on and go wandering through this indigenous forest, refuge to many wetland and coastal forest birds and animals, but just at the entrance, we saw a sign warning us that for security reasons it’s now inadvisable to enter this area alone and without a trained guide, so we turned back. 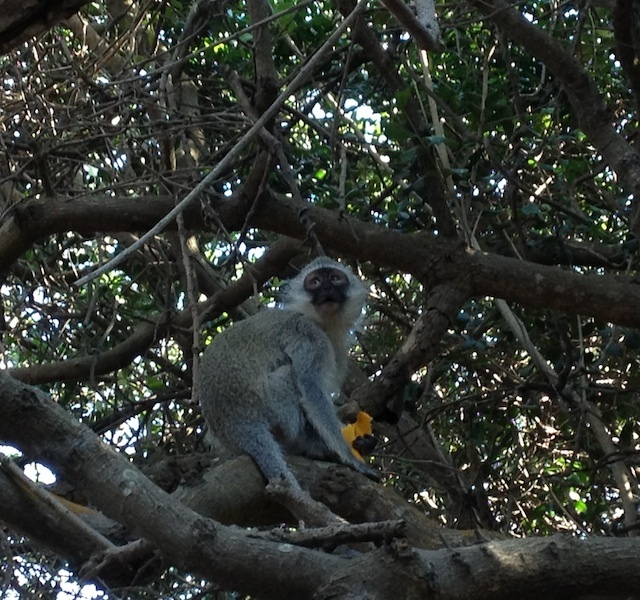 Just at that moment, we heard a raucous call, which could only be a monkey, and peering into the foliage, we saw a merry band of Vervets, flitting from tree to tree. They moved so fast that we couldn’t catch them on camera, but luckily, for a fleeting moment, one of them stopped to examine a piece of orange peel which he’d picked up from the path, and he looked straight at us, before turning tail and going in pursuit of his mates. 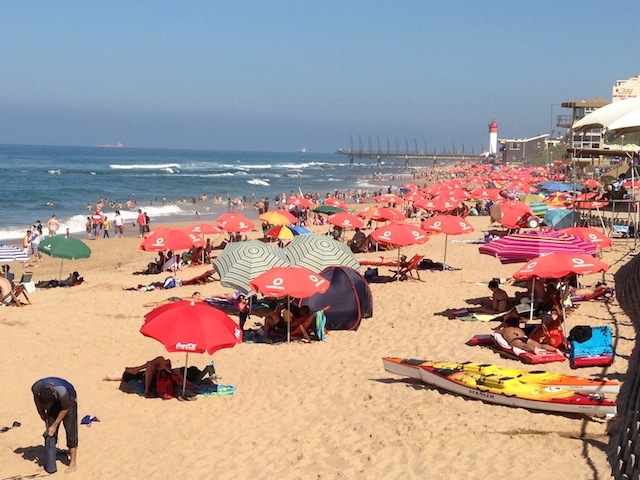 I decided that for Jake’s Sunday Post challenge this week, I would show you my seaside ‘village’ of Umhlanga Rocks, situated on the east coast of South Africa, facing the warm waters of the Indian Ocean. Visitors from overseas, as well as all over South Africa, flock to our resort village, to relax and have fun on one of the most beautiful coastlines in the world. 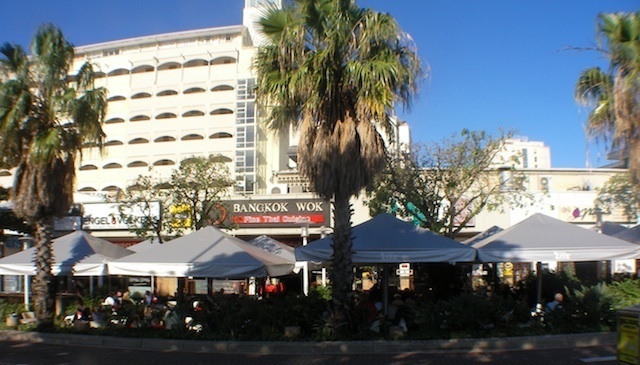 The warm subtropical climate means that one can have fun in the sun all the year round. We are so proud of this brilliant new pier, which was built only a couple of years ago. 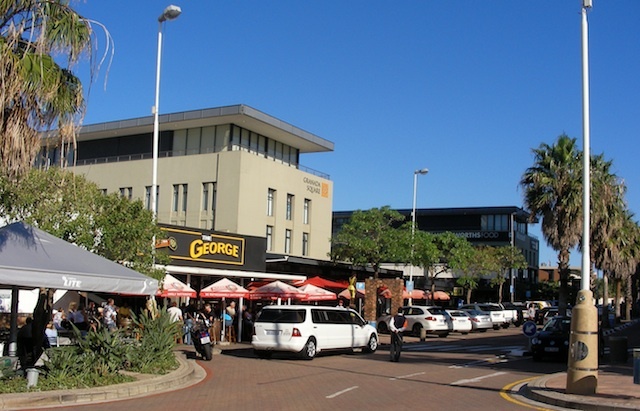 This area was once the home of the San hunter-gatherers, but was later occupied by Nguni-speaking people who were unified under King Shaka in the early 1800’s into the proud Zulu nation. It came under British control soon after, and became part of the large estate belonging to Sir Marshall Campbell, who sailed to South Africa in 1850. Indian indentured labourers were brought to work on the sugar plantations, with the result that today this area has a vibrant and colourful multiracial flavour. The sugar plantations in our area have all but disappeared to make way for property development. In 1869, the first beach cottage was built on a rocky site overlooking the sea. The owners served tea and scones to passers by, and the reflective roof of the cottage was used as a beacon by passing ships’ captains to navigate safely around the rocky headland. This cottage was converted into the Oyster Box Hotel hotel in the 1930’s, and in 1953, this distinctive red and white lighthouse was built right in front of it. 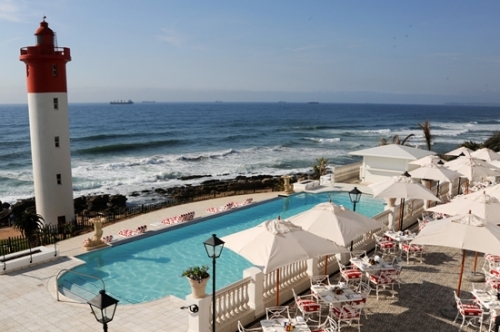 This hotel has recently been upgraded to the highest 5 star standards, and is an absolute pleasure to visit. It has some of the best restaurants you could ever wish to dine in. 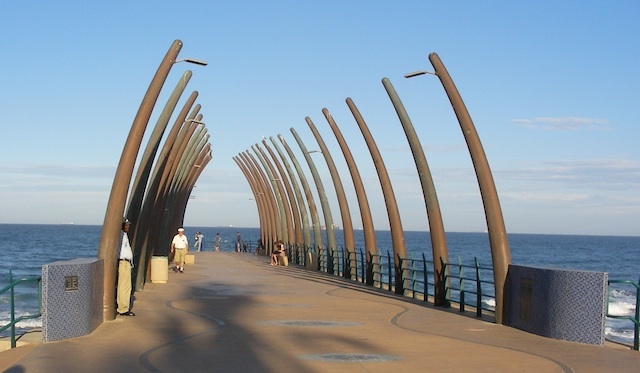 Umhlanga was a favourite family holiday destination for us for many years, and when we retired, we decided to leave Johannesburg and settle here at the coast, as the climate is wonderful. 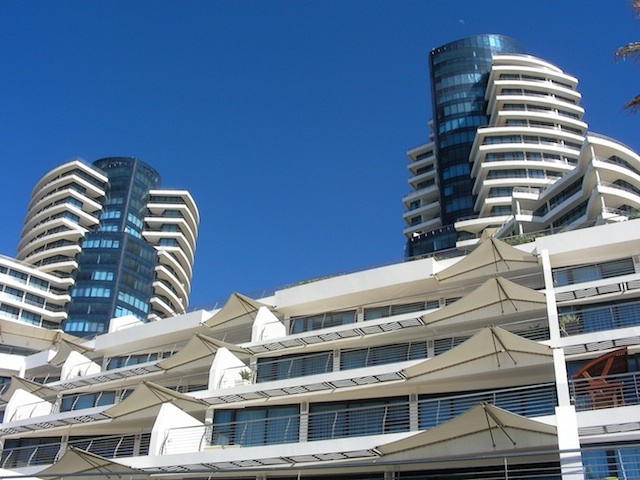 Over the past few decades we’ve seen a lot of change, and the older hotels have either been refurbished into magnificent 5 star establishments, or demolished to make way for huge holiday apartment buildings such as this one. The village as such hasn’t got any bigger, but of course it’s changed a lot. There used to be just a few small shops along the main street, mostly selling buckets and spades, sun hats and swimsuits, but now, there is a plethora of restaurants and pubs in order to cater for the increased inflow of tourists. The George pub is a well known watering hole in our village. 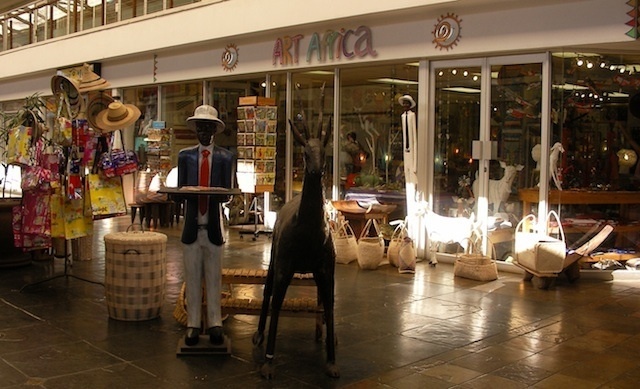 and of course there are the african curio shops for the overseas visitors. 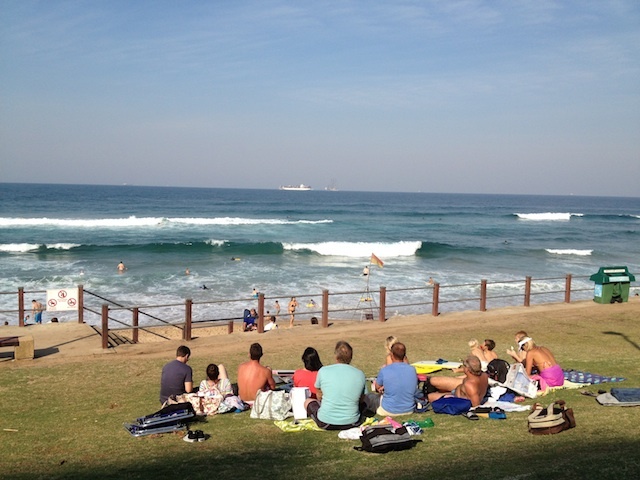 Mostly it’s just nice to relax and watch the surfers doing their thing. At peak times, it seems a rather overcrowded village to us locals, and we can’t get a parking space for love or money, but for the rest of the year, it’s the ideal village to live in. The Grizzly and Wolf Discovery Centre is next on our to ‘do list’, so off we drive to the west entrance of Yellowstone Park. This centre provides an opportunity to observe, learn and appreciate grizzly bears and gray wolves. The first guy we come upon is this huge brown bear. These adult bears generally weigh between 100 and 600 kg (220 and 1,300 lb). Next up were these playful twins. They were having such fun together, but of course they were well matched with one another. 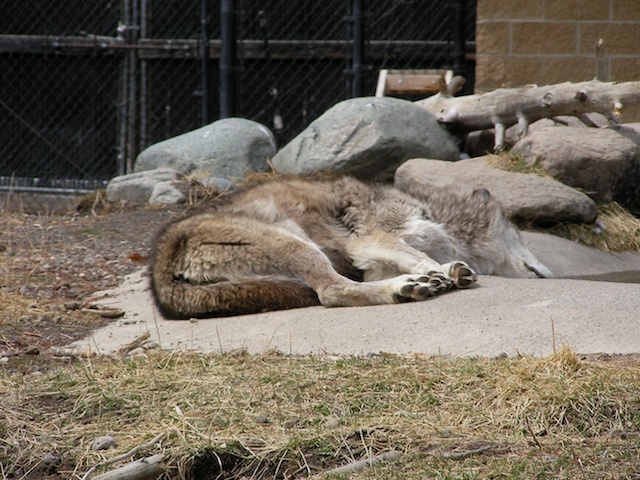 The grey wolves are mostly hiding away, but we see this one, which isn’t at all interested in entertaining the visitors, and appears to be sleeping. 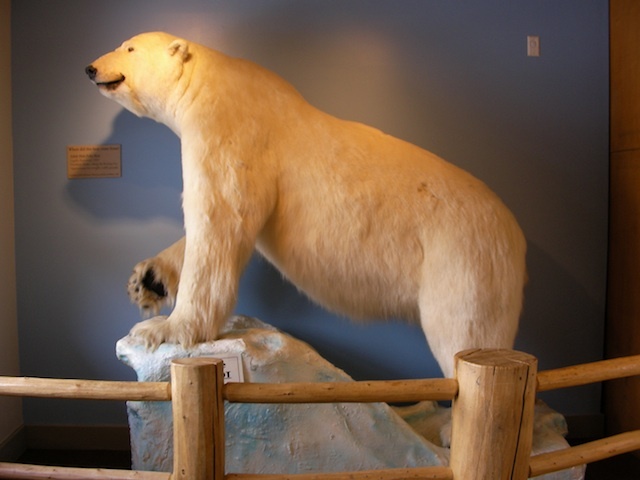 There are quite a few stuffed animals there, and this Polar Bear is the biggest of the lot. 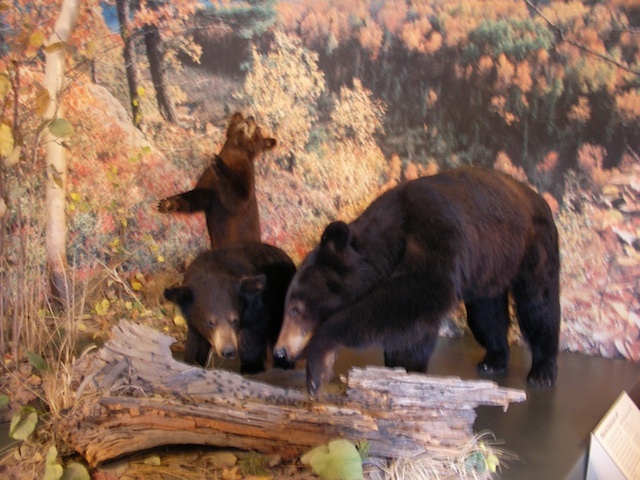 Here is a display of Black Bears, which are the smallest and most common bears in North America. 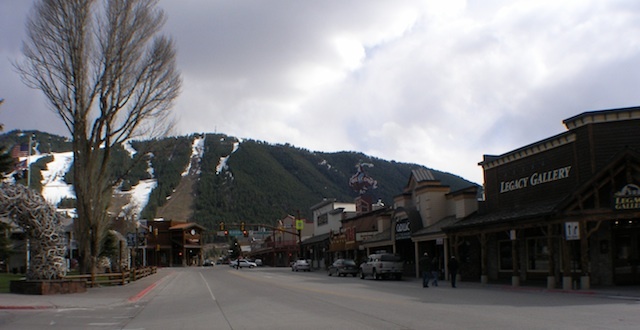 After seeing all there is to see, and eating lunch at the cafe, we’re bouncing along the bumpy road on our way to Jackson Hole, where we’re to spend the night before flying back to New York. 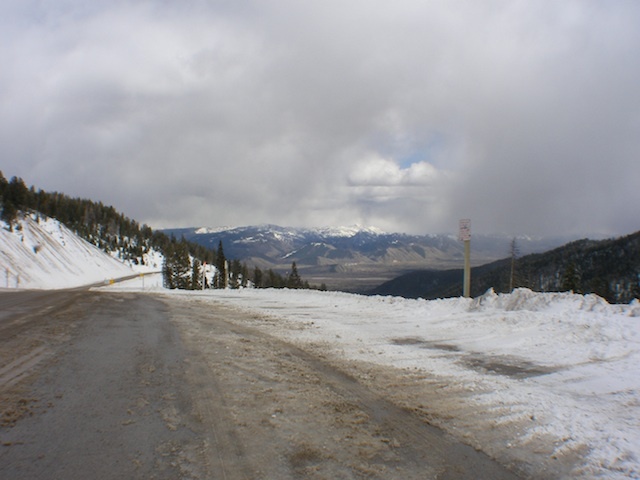 There’s more snow lying around now and we’re back into Wyoming and on the Teton Pass. I want a couple of pics, but the snow is so deep in the lay-byes, that we can’t stop until we reach the top of the Pass. We finally find a place to pull in and the snow drift at the side is really tall, three to four metres high! A young woman skier suddenly appears over the top of the drift with her two dogs, and they all pile into a truck. Hubby takes pics down each side of the Pass and says he can see the rooftop of a hut, peeking out of the snow on the other side of the drift. As he gets back into the car, snow blows off the top, straight at him. 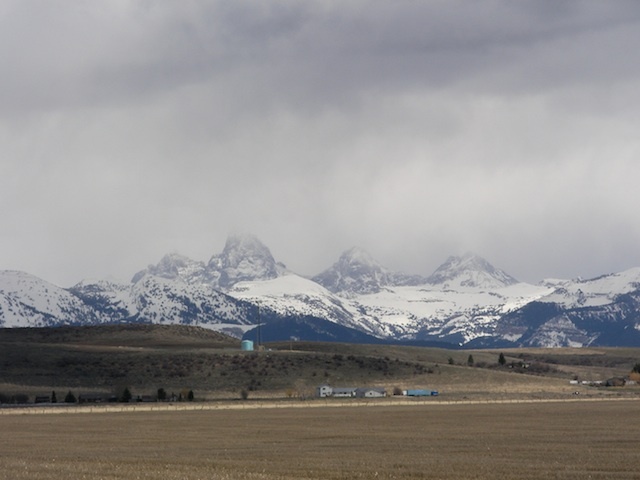 The high peaks of the snow covered Teton Range, which is estimated to be between 3 and 10 million years old, rise almost 7,000 feet from the valley floor. We’re on icy roads again, but we’re old hands at this game now, and I’m relaxed. The scenery in this region, is magnificent. 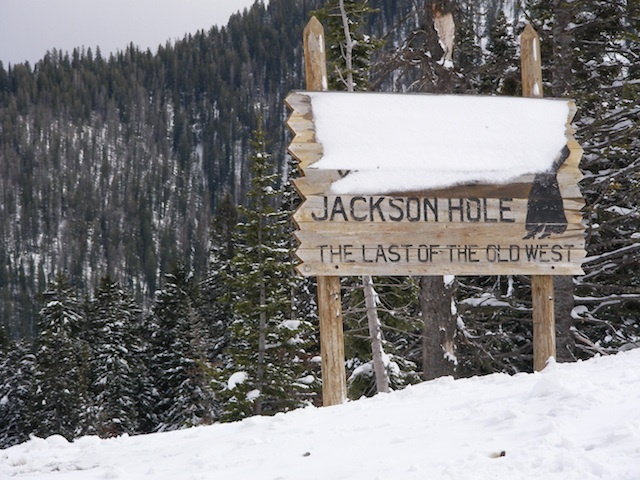 Coming out of the Pass, it’s only ten more minutes to Jackson Hole and our last night in Wyoming. It’s quite a ‘one horse’ town, with only about 10,000 inhabitants, but it has an ‘olde-worlde’ charm, all of its own. I would thoroughly recommend this trip to any of you who have the opportunity to go there. Old Faithful revisited, icicles and steaming geysers. The seventh day of our memorable journey to Yellowstone National Park. “Last night, (Monday) was very stormy and noisy, with the wind howling and thunder crashing, way into the small hours. Nevertheless, I had quite a good night’s sleep except for the fact that the people in the room next door, got up at 1am and banged around until they left about 1-45. Hubby didn’t even stir. He’s a much sounder sleeper than I am. We awake to wonderful sunshine, and -4 degrees C. Slightly on the cool side for my liking. 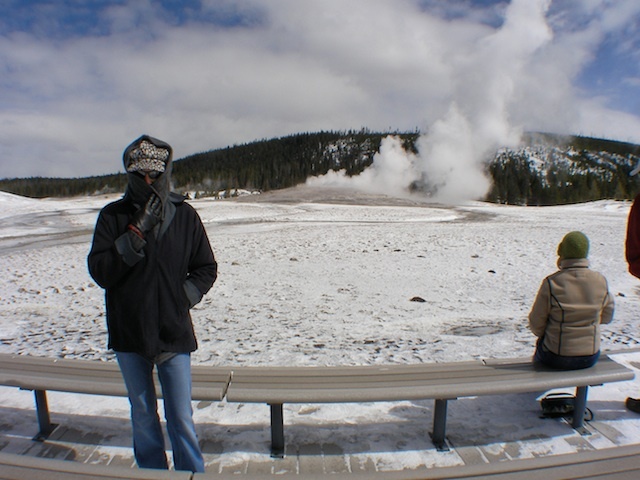 Hubby decides that we need to go back to “Old Faithful” to get a pic of the eruption in the sunshine instead of the snow. At the entrance gate to the Park, we have to open the door to give in our ticket, as the car window won’t wind down; it’s frozen closed for now at least. The road’s really icy but free of snow, and according to the GPS, our journey will take 53 mins. At breakfast, a guy is showing around some pics he got of a Grizzly and a wolf yesterday. He has been here in the Park for a week though, so ought to have something to show for it. Before we leave the hotel, not to be outdone, I get a pic of me with a wooden Yogi Bear. The rivers and mountains are glistening this morning, such a change from yesterday’s snowy grey mist. The road is very icy and we’re hoping it will be clear by the time we drive back along this route later today. We turn right at Madison Junction, elevation about 2000m and it’s now 25 kms to “Old Faithful. ” The roads are pure white now, and a snow plough passes us going downhill in the opposite direction, and sprays us with snow. We can see blue sky in the distance, and it’s looking quite promising so far. Now we catch up with a long line of cars going very slowly. There are two Bison sauntering nonchalantly down the other side of the road, and they don’t even glance our way as we pass. I’m sure they are quite disdainful of these strange metal creatures that whizz past them every day on four wheels instead of four legs. A bit further down the road, the long procession of cars grinds to a halt on the snowy road. These regular sedans just aren’t coping with the icy roads as well as our huge 4X4 truck, and eventually we manage to overtake them. Now it’s all clear ahead and we might make it just in time for the next eruption. It’s due very soon, so we’re on a mission. There are odd patches of melted ice on the road and hubby wonders out loud, if this may be an indication of a geyser underneath the tarmac at these points. I sure hope it doesn’t suddenly burst through the tarmac just as we get there. Only 5kms to go and the sun is brilliant in a clear blue sky. I hope it stays this way at least until after the next eruption. We pass more bison trudging along the road. Their coats look really mangy and matted. Not very cuddly at all. It’s 10 am when we arrive and hubby dashes for the loo before going to the visitors centre to confirm the time of the next eruption. Whilst I’m waiting in the car, a coach pulls up in front of me, and as the door opens I see someone sitting on the front seat, wearing red peep-toe sandals. “Not quite the correct footwear for this weather” I think, looking down at my snug and sturdy snow boots. We have almost an hour to wait, and go into the lovely warm shop to browse and have a hot chocolate. I go to the loo and have just sat down, when there’s a rapping on the door, and a man’s voice calls, “Can I come in?” Eeeek,! I manage to squeak, “NO, I’m in here!” I suppose he just wanted to come in to clean, but he could have timed it better, and anyway, why do they have men cleaning the women’s loos? The women at the cash desk says to hubby, “Love yer accent. Where yer from?” She seems fascinated that we’re so far from home. All too soon, it’s time to go outside again and I’m trying to work out how many layers of clothing I can fit under my coat. I have tights under my jeans, a vest under my T shirt, over which is a woolly jacket with a hood, two scarves, a hat, gloves and lastly my coat. That should do it; even my own mother wouldn’t recognise me. It feels much colder than yesterday and the wind chill factor is serious stuff. Very crisp to say the least. There are icicles still hanging off the car and around the wheel hubs. We walk down to the viewing point yet again and join the other frozen viewers. The timing is spot on today and at 10-53am exactly, huge amounts of steam shoot way up into the air. It’s not quite as spectacularly high as yesterday, but at least we can see it better without the snow. Back in the relative warmth of the car, we head for West Yellowstone to visit the Bear and Wolf park. The snow is melting on the roads and it’s -4 degrees. Someone has obviously put salt on the roads in the last hour or so. Hubby tells me to keep all my layers on as I have to go over the steaming bridge with him today and up the hill where he took the photos yesterday. We see copious clouds of steam rising in the distance and we’re almost at Midway Geyser. The wind chill is unbelievable as we slip and slide our way up the boardwalk. I’m so glad I’m wrapped up well. It’s really worth braving the cold for as we look down into the icicle-ringed geyser. It may be cold up here, but it sure looks hot down there. There are only two loos in the car park; hubby takes one and I the other. Neither of them have locks, and after a couple of minutes, I hear hubby’s door open and his voice saying, “ I’m almost done.” A guy mutters an apology, and before I can get up and grab my door handle, it’s yanked open. This horrified guy, seeing me with my trousers down, hurriedly slams the door shut again. I scuttle out afterwards back to the car, hoping never to see him again. What a scream! I had to laugh, and chuckled for quite a while afterwards. I sincerely hope there won’t be a third such incident today. Full steam ahead at Yellowstone Park. 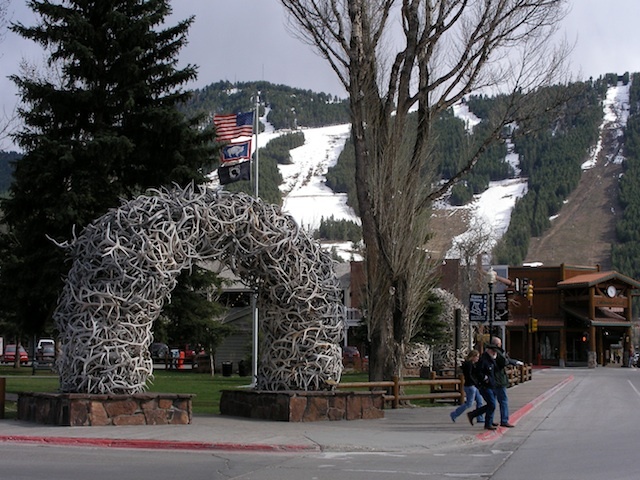 Ailsa’s travel theme, ‘Parks’, came at just the right time for my Yellowstone Park post. Yellowstone National Park spans an area of 3,468.4 square miles (8,983 km2), comprising lakes, canyons, rivers and mountain ranges, and is thought to have been the first such park in the world. It was established by the U.S.Congress, and signed into law by President Ulysses S Grant, on March 1, 1872, so is 150 years old. From my journal of May 4th, 2010, this is the sixth day of our journey. “Today is cold, wet and grey as we head back into the park. As we enter, and just before Mammoth Springs, we see a whole flock of black carrion crows, feeding on the remains of a kill by the river. Hubby asks if I want a pic, but “not really” is my reply. Gruesome stuff, although thinking about it afterwards; we eat meat almost every day, so why shouldn’t they? We pass by a camp ground with hardy folk sitting eating breakfast outside their tents in 4 degrees. Brrr!! A few flakes of snow are falling as we arrive at the town, and the only sign of the buffalo we’d seen on the lawn yesterday, are their sizeable droppings on the grass. We stop to fill up the tank yet again. This huge vehicle is a very thirsty animal, but great nevertheless, especially on these icy roads. Snow has fallen overnight and it looks colder than yesterday. I am so glad we did the Mammoth Hot Springs yesterday afternoon when the weather was much brighter. We’re aiming for ‘Old Faithful’, 50 miles away. A snow plough heads towards the town, and I hope he’s been busy clearing the road we’ll be travelling on later. The mountains look beautiful with their snowy blanket, and once again, hardy hubby, obligingly gets out of the car to take a pic. The road is icy as we pass ‘Swan Lake Flat’ and we are in 4 wheel drive as we get to ‘Sheep-eater Cliff’. I love these names. The temperature has dropped to 0 degrees now and the road is rougher, with more snow and ice. We’ve only seen a couple of other vehicles so far, but further up the road, we see two parked cars, and stop to see what they’re looking at with their tripod all set up just inside the woods. I thought it might be Yogi Bear, so my intrepid driver goes to investigate. Suddenly there is a tapping on the window, and a ranger asks if I can move the car as we’re not allowed to park here. I wouldn’t even like to try, so send him off to find hubby, who returns, saying, “There’s a grizzly bear up there, but you can barely see him.” So no Yogi Bear pic today. We’re staying near the Bear Park tonight, so should have more luck there. We pass “Grizzly Lake’ with not a Grizzly in sight. Along the way are pools and lakes of steaming water. “ What lies beneath?” I wonder. We see a red RAV4 bogged down in a ditch, and park rangers are directing traffic. He was obviously going too fast on the icy road, and is really lucky that he didn’t land in a cauldron of boiling water. “That would teach him a lesson,” I think to myself, “Oh misery, to have an accident in this weather!” We turn off to Norris and “Yay,” there are loos there. It’s a long-drop, but exceptionally clean and even sweet smelling. We stop off at the Norris Geyser Basin and hubby gets out again. I sit debating whether to brave the cold and snow and finally decide it’s worth it, so I put on an extra jersey under my coat, snow boots, scarf, hat and gloves and set off. It’s quite a walk and I’m hoping to meet up with hubby before too long. I’ve never felt so cold in my whole life. I see him at the main viewing site. It’s all on raised walkways around the geysers, and steam is coming out of all orifices. It sounds like a huge washing machine churning away and smells of sulphur. Scary stuff! From there, we drive on towards the Caldera boundary. The steepness of the incline tells us that we‘re driving across the edge of it. There’s nothing further of interest along this route, so we head back to the main road and on towards “Old Faithful.” Thirty miles still to go, as we drive over a bridge with steam rising up on both sides. We’re stopped for about 15 minutes because of road works, and hungrily devour the leftover chicken pizza from last night’s dinner. It tastes delicious even though it’s cold. Finally we’re allowed through and there are 16 miles still to go. All along the way, the wind is howling and the ground either side is steaming.It feels somewhat surreal. Quite different from normal everyday life. When we eventually arrive at the Old Faithful visitor centre, we’re told it’s an hour till the next eruption, so we warm ourselves with a hot chocolate, and ten minutes before time, wrap ourselves warmly and head out to the viewing area. It’s snowing a lot now, and there are maybe seventy people all standing in icy anticipation for about twenty minutes. Puffs of steam keep popping out and then disappearing again, and we think that might be all we are going to get. Ah well. Just when I’ve almost given up hope, the steam goes berserk and shoots maybe 50 meters into the air. Next stop is our hotel in West Yellowstone. There are a few sites of interest along the way and one in particular which hubby decides is worth braving the snow for. I stay in the car whilst he disappears across a bridge into the steamy mist. Twenty minutes later, he’s still not back. This is my man who moans about the couple of degrees drop in temperature between Umhlanga and Kloof when we visit my sister. Unbelievable that he stays out there for so long! I strain my eyes to see if he’s coming back, but now even the bridge has disappeared. Suddenly the steam clears and I see a lone figure coming across the bridge, stopping to take more photos. “Where have you been?” I ask as he shivers into the car. “Right to the top of the hill. It’s amazing up there,” he replies. I can’t wait to see these amazing pics. Tomorrow we’ll revisit Old Faithful, and go to see some BIG Teddy bears. 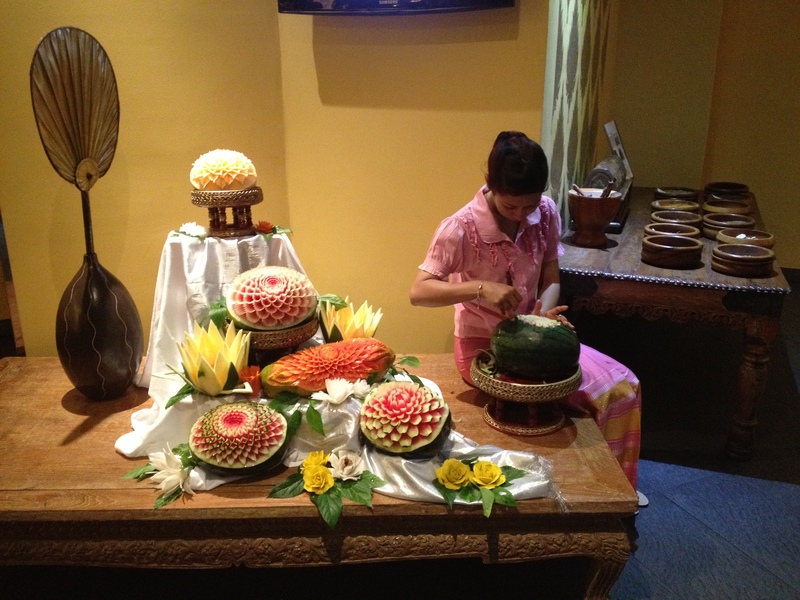 The Daily Post challenge, ‘Create’, made me remember this lovely young Thai woman, who was serenely sculpting away at these fruits one evening as we walked into the dining room at our Phuket resort. Such skill and patience. Of course there are many types of creativity, and a very enthusiastic tattoo artist had been scarily creative on this woman’s body. Every weekend, Viewfromtheside gives us a theme to ponder upon. This time the subject is ‘Food’, and it got me thinking about how omnipresent and pervasive this essential commodity is. 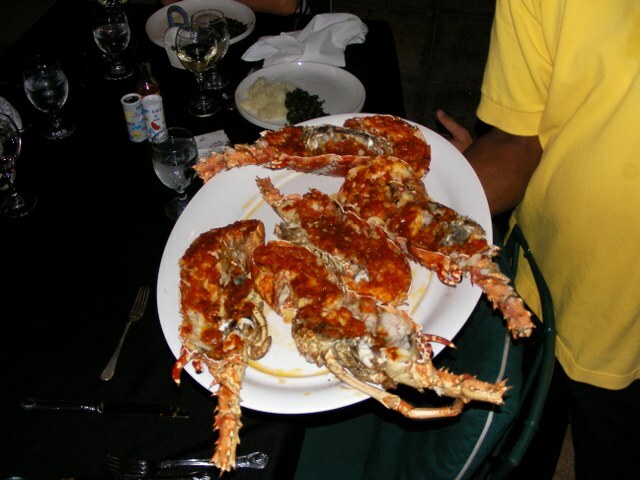 Of course, we all need to eat to survive, but certainly not in such large quantities that some people do. You can’t switch on the TV without being bombarded with food commercials. Walking around the town or city, there are restaurants galore and huge billboards showing giant burgers with fries. Even at the cinema, we’re encouraged to take in giant cold drinks and even bigger buckets of popcorn. It seems that no activity can be entirely food free. Gyms and sports clubs, also have the obligatory coffee bars and restaurants, so that after exercising, you can put back all those calories you worked so hard to lose. 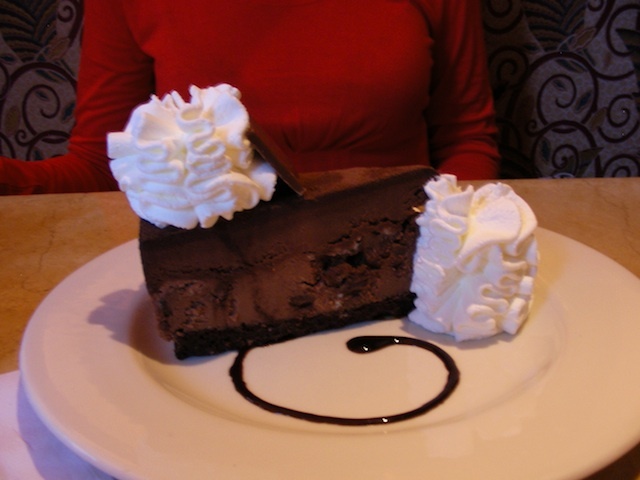 From morning to evening, we’re faced with the nonstop temptation to eat. No wonder that obesity is so rife and such a major global health concern. Of course no-one forces us to pick up the food and put it in our mouths. It’s a conscious decision on our part, and exactly what we eat is also up to us. Most nations have a national dish, and there are so many foodstuffs which whilst thoroughly enjoyed by some cultures, would be abhorred by others. 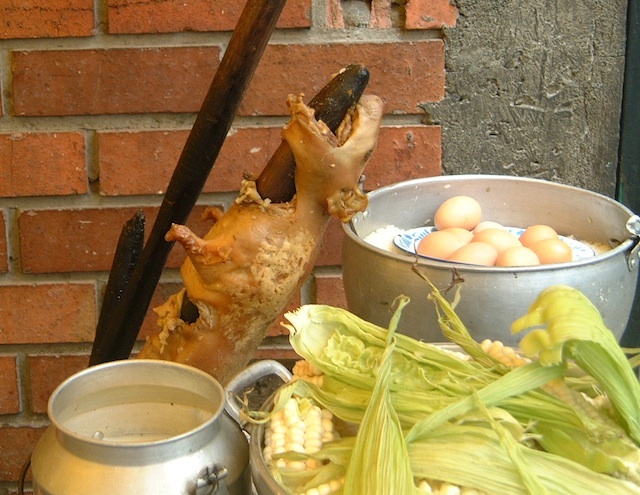 For example, this poor guinea pig, roasted on a spit is considered quite normal in Peru, but I’m sure not many of us would want to try it. 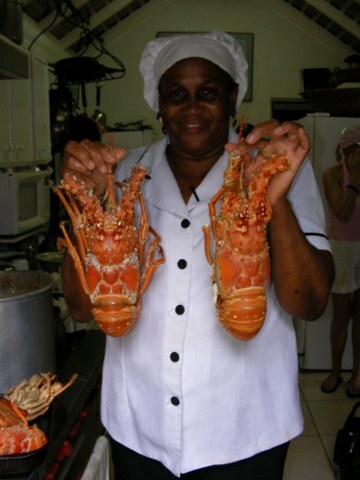 On the other hand, I didn’t feel any remorse whatsoever, whilst enjoying these crayfish, which we had in Jamaica. Different cultures have different ideas about what is edible, and in some countries, it’s perfectly acceptable to dine on insects such as wasps and grasshoppers. Scientists say that eating such insects has health benefits, and should be encouraged in the Western diet. Bugs are apparently rich in protein and low in cholesterol, and 1,700 species are eaten in 13 countries around the world. The late Emperor Hirohito of Japan’s favourite dish was wasps with rice, whilst Columbians eat ants, which they grind and spread on bread. Filipinos are partial to grasshoppers, crickets and locusts. I’m afraid that I’m definitely not tempted, even though crickets are a rich source of iron, zinc and calcium. Wishing you all a delicious weekend. I thought we never would, but finally, we reach Yellowstone! Day 5 of my ‘Great American Road Trip.’ From my journal, May 3rd 2010. “We were quite late leaving Billings, as I didn’t get to bed until after midnight, and don’t wake up until 8am. After a quick breakfast, we set off on the 3 hour drive to the NW gate of the park. We stop for yet more petrol, then get onto the Interstate 90 and are once more on our merry way. We pass builder’s and lumber yards, farm machinery suppliers, many trailer parks, and small housing estates. The scenery is a curious mixture of industrial parks and scrap yards, with the odd farm dotted in between. The railway runs alongside the highway and cows graze right next to it. This is definitely not a scenic route so far, as even the farms looked more like scrap yards. We pass a sign to “Montana Factory Outlets,” and I read it out loud, but Hubby’s ears are tightly closed. No time for retail therapy today, even though there’s no sales tax in Montana. We pass derelict houses and barns. It seems that when people abandon them, they do just that, and leave them to rot and eventually fall in on themselves. They build the new house, sometimes right next door to the old one. We saw a new church the other day with the old one falling down right next to it. Very weird. As we come over a rise, Yellowstone suddenly appears on the horizon, all white and sparkling in the sun. We’re still in grey wet weather though, and the trees along the route are bare and untouched by Spring. After about an hour, the rain has stopped, the sun shines through, and the scenery improves dramatically. There’s a Rest Area, so we stop for a wee break before entering the park. Faced with a choice between McDonald’s and Arby’s, I decide in this case “Better the devil you don’t know.” It isn’t too bad, and the apple turnover I have, is so flaky that it melts in the mouth and all over the table too. Then we were off on the way to Gardiner, fifty one miles to go. We pass “Slip ‘n Slide Ranch” and then stop to take a photo of “Devil’s Slide,” which, according to the brass plaque, is where the long-horned sheep have been coming down for centuries to drink at the river. I would love to see them come slipping and sliding down that rock face, but there aren’t any thirsty sheep today. The Town Centre has its own Justice Centre, Post Office, Church, etc. and there are many buffalo and deer, grazing the grass on the lawn there. As we’re driving further along, we see more Buffalo crossing the road and have to stop. We definitely do not approach them. They approach us! HELP!!! Along the way, is a petrified tree, 50 million years old. The plaque says that it’s indistinguishable from the modern Redwood which grows in coastal sub tropical areas. This tells us that in the past, the climate in Yellowstone was very different from what it is today. I just can’t imagine this freezing place as ever being sub tropical. Pronghorn deer peacefully graze at the side of the road. The scenery all around us is magnificent and majestic, as the following pics show. Have a great weekend, everyone, whether you’re in winter or summer. Awesome Mount Rushmore, Crazy Horse, and Deadwood. “After a good night’s sleep and an adequate breakfast, we set off from Rapid City to Mount Rushmore. The sun is shining, but it isn’t at all warm. I’m blown across the car park with my just blow dried hair flying in all directions, especially over my eyes. There’s no sign of snow and I can see patches of blue sky peeping through the grey clouds. Eight degrees centigrade. Luxury! As we drive through the town, we see amazing life size bronze statues of past presidents. There are apparently 17 of these dotted around the sidewalks. Hubby remarks that they wouldn’t last long in a South African city. They would all be carted away in the night and sold for scrap metal. Sad isn’t it? As we drive out of town, every second building we pass seems to be a motel or a restaurant. We stop for petrol and I’m so grateful it isn’t me who has to get out and stand in the freezing wind to fill the tank. No petrol attendants here, or in England for that matter. We are very spoilt in South Africa, sitting in the car whilst our windscreens are washed and our tanks filled. We’re now in South Dakota and I’m singing that old Doris Day song, “Take me back to the Black hills, the Black hills of Dakota.” How do I even know that song?? Surely it was long before my time! The rocks look like black slate and are covered with pine trees. I must have seen a zillion of them in the last few days. We pass by ‘Thunder Goldmine, Crystal Caverns, Get Lost Maze,’ and many other tourist sites. This place must really be buzzing in the holiday season, but not in this weather. The highway passes through the Black Forest, and the temperature starts to drop as we roll into historic Keystone, a picturesque town of wooden shop fronts. Hubby braves the biting wind to get a photo. We’re soon out of town and heading up towards Mount Rushmore National Memorial. As we round a bend at the top of the hill, suddenly, there it is in all it’s amazing glory. Absolutely breathtakingly stunning! The faces are so unbelievably lifelike and their eyes seem to look straight at you. We drive into the car park and I’m so glad of my warm coat, hat and scarf. It’s icy cold and the wind is whistling all around us. After getting a closer look, we go into the shop where it’s lovely and warm and I buy my Mom some pink and white Mount Rushmore socks and a coffee mug which I know she’ll be very proud of. Then we’re off to “Crazy Horse” 17 miles away, past ‘ Horse Thief Lake and Breezy Picnic Area.’ (You can say that again!) Never a more breezy place have I visited. 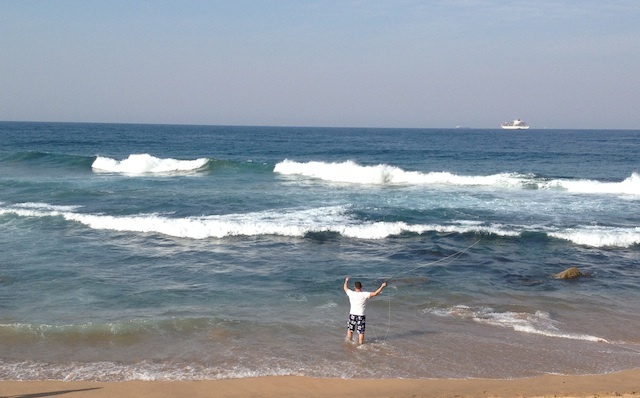 I’ll never moan about the wind in Umhlanga again. Driving along, there are snowflakes falling and we spot a few wooden houses through the fir trees. Higher up, there are still large patches of snow as we approach the Crazy Horse Monument. It’s still under construction and is HUMONGOUS! They say that the Mount Rushmore sculpture would fit into just the head of Crazy Horse. It was started in 1948 by a Polish American, Korczak Ziolkowski and after his death in 1982, his wife and seven of his ten children have carried on the work. The video we saw of how it all came about, was truly awe inspiring. What a story! This is a model on the left showing what the finished sculpture will look like, with the actual in the distance. Then we’re off to Deadwood, a 90 minute drive away and it’s started to snow again. No blue sky left, just heavy white clouds. We cross the bridge over Pactola Lake and there‘s nothing to see except more pine trees, tiny snowflakes, and sleet. We pass a sign to Nemo, but there’ll be no finding him today. We’re on a mission to get to Deadwood and have some lunch. When we arrive we see a place called ‘Mustang Sally’s’, opposite the Harley dealer, and decide it will be a good place to eat. This place has seen better days and has lots of mismatched tables and chairs and a dozen huge TV screens each showing a different sports channel. Framed baseball shirts line the walls and there’s a cabinet full of silver trophies. I sit and watch the 136th Kentucky Derby as I eat my butterflied shrimp and French fries. In the ladies loo there’s a dispenser for “Slick Willy” condoms. Love the name! 😉 The town is mainly gaming parlors and sports saloons and I’m sure in the tourist season, is absolutely frenetic. Then we’re on our way to Billings, a 5 hour drive on the Interstate. Hubby announces, “Next stop Custer’s Last Stand.” It’s 6pm when we arrive at the Custer Memorial and they’re just closing the gates, but hubby pleads with the man in charge to just let us in long enough to take a couple of photos, and he obliges; good man. This is the site of The Battle of Little Bighorn where General Custer and his men were defeated by the Red Indians led by Sitting Bull and Crazy Horse. It has a really eerie feeling to it, as we stand there in the cold wind, surveying this historic scene. Next stop along the way is the Trading Post Cafe where we have “Cowboy soup and Indian fried bread.” Very good for the waistline I’m sure. 😉 It’s very tasty though.